Home Areas Arts March. yep. Its back. So. here it goes. last thursdays NAFcaf(e) (and, by the way, thanks for coming, you gorgous lot, it was sweet like chocolate, but not the heap thorntons for a quid kind, i mean those small luxurious round ones that are like, £2 each or something , that you can fit 5 in your mouth at a time this pretty much eating a very sweet £20 note in one go…. i imagine…..) launches us forward into our yearly easter-time arts festival extravaganza that is Arts March!! Once again we have something on each weekend of the month, free entry, and suitable (in fact more that suitable, custom made just for you and all your lovelies) for all ages. 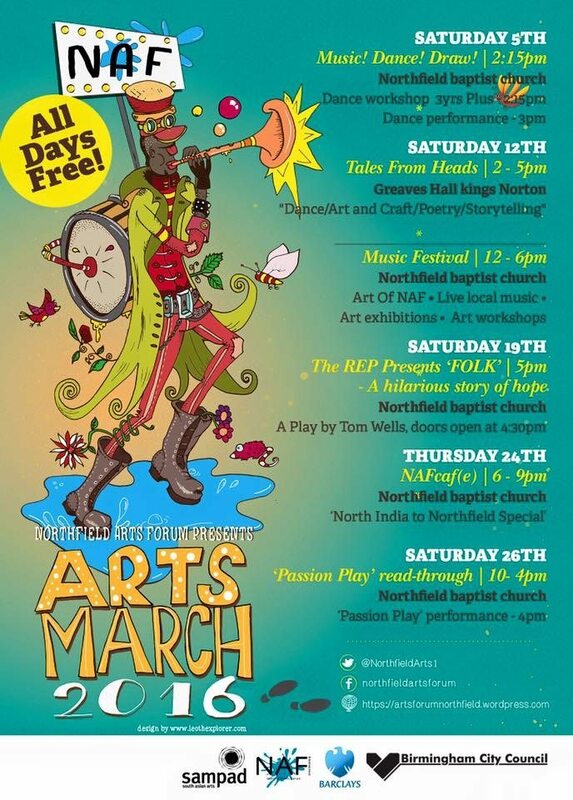 Its all (apart from one event) at Northfield Baptist Church, so easy to get to, lots of free parking near by, and a lovely, open and welcoming venue. 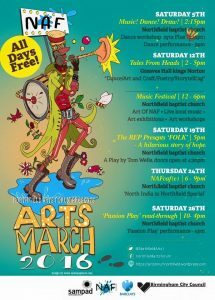 This coming sat, 5th March, we have our yearly dance festival showcasing the wonderful local dance and art talent: Music! Dance! Draw! there is a dance workshop (same as last year) for younger kids and families at 2.30pm then the show itself starts at 3pm! Get yourself along to enjoy the local dance, and if you love drawing/painting, come and sketch along to the performances. Just like last year we want to encourage everyone to draw along, so we dont have an audience, instead we have a room full of artists(you!!). Then the following sat, 12th march, we have our Music festival/Art exhibition. If you play email back and we can book you a slot/if you want to listen to lovely live music, get along, if you paint or make anything creative what so ever, bring it and we can display it/just love to look at wonderful art? come along and have a look! Our surplus cafe will provide food, drinks and cake all day too. We also have an afternoon of workshops and performances in Kings Norton, Grieves Hall, on the 12th. Showcasing the work from our fabulous Tales From heads project. Sat 19th we have a play by the wonderful REP, plus a drama workshop by them in the day. Limited places so email back if you want to book in! Thursday 24th march its our NAFcaf(e) North India to Northfield SAMPAD special. Same place and time, with a North Indian flavour. finally sat 26th March we are putting together a day of drama workshops to plan and put on a Passion Play performance. Again, limited spaces so email or phone if you want to be involved. That’s a lot of free, fabulous, arty, crafty, all agey, not new agey (might be, i dont really know what that means) stuff, things, whatsits and thingameebobs. Plus, here is a flyer about it all, stick it all in your diary and forward the flyer on please!! Next articleReaction: Fusion Festival to go to Liverpool for 2016 – but will it be back? !